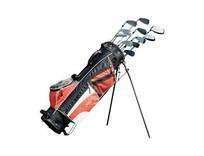 Complete set of Howson XT Tour golf clubs with golf bag. Ideal for the beginner and lady golfer. All clubs have True-Temper steel shafts and an enlarged sweet-spot for the best strike. The irons have a cavity back design for better control and flight. 1 x driver 400cc - steel shaft. 1 x wood no.3 - steel shaft. 8 x irons no. 4, 5, 6, 7, 8, 9, pitching wedge and sand wedge - steel shafts. I wonder if these have the special feature where your club head comes off on the practice swing to show where your ball would have landed?